Following a comprehensive treatment of Nevanlinna's theory of value distribution, the author presents advances made since Hayman's work on the value distribution of differential polynomials and illustrates how value- and pair-sharing problems are linked to algebraic curves and Briot-Bouquet differential equations. In addition to discussing classical applications of Nevanlinna theory, the book outlines state-of-the-art research, such as the effect of the Yosida and Zalcman-Pang method of re-scaling to algebraic differential equations, and presents the Painleve-Yosida theorem, which relates Painleve transcendents and solutions to selected 2D Hamiltonian systems to certain Yosida classes of meromorphic functions. 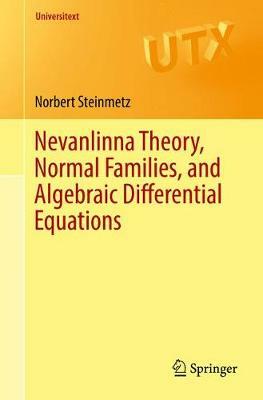 Aimed at graduate students interested in recent developments in the field and researchers working on related problems, Nevanlinna Theory, Normal Families, and Algebraic Differential Equations will also be of interest to complex analysts looking for an introduction to various topics in the subject area. With examples, exercises and proofs seamlessly intertwined with the body of the text, this book is particularly suitable for the more advanced reader.